Lockheed P-38 Lightning was one of America's most outstanding fighters of World War II. It was slower and less manoeuvrable than the Republic P-47 Thunderbolt and the North American P-51 Mustang but its offensive reputation was second to none: so much so that the Luftwaffe referred to the Lightning as "der gabel-schwanz tenfel" ( the forked-tailed devil). 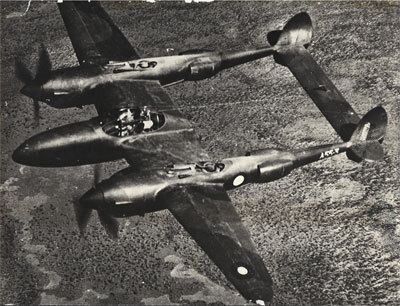 Although the P-38 Lightning was primarily a fighter, its limited use by the RAAF was solely in a photo reconnaisance role. Design work on the Lightning began in 1937 and the prototype XP-38 first flew on 27 January 1939. Improved versions followed and by August 1945, a total of 9,923 Lightnings had been built. Throughout the war years the Lightning served in many areas but it was particularly successful in the Pacific theatre where its long-range and twin-engine capabilities proved to be most effective. In order to meet an urgent RAAF requirement for photographic reconnaissance, three P-38Es were transferred from the USAAC for service with No 1 Photographic Reconnaissance Unit. A55-1, was received on 31 August 1942, and operated successfully until it was written-off in a landing accident on 2 August 1944 at Coomalie Creek. A55-2 had a less spectacular career and operated only between 4 September 1942 and 18 December 1942, being phased out of service on the latter date. The third Lightning, A55-3 was received from the on 27 February 1943 and operated throughout the year until it was written-off in a wheels-up landing on 10 December 1943. The P-38E was not actually designed as a PR aircraft, but circumstances caused it to be used in this role by the RAAF.